This is the second post about Rose liqueur, and hopefully I'm saying something, unlike in the quote above. There’s a reason for this second post because this recipe is not the same as the last rose liqueur. Well, almost not the same. This one’s easier, for one thing. The rosa rugosa are still blooming and I couldn’t pass up the opportunity to use some of my 375 ml bottles. I only really had one issue with making this liqueur the first time. If any of you read or made it, the recipe called for removing the white tip from each individual petal because it's bitter. I dutifully picked off all the white ends from my petals for the first batch. It was a long, tedious, thankless job. So I wondered, how much difference does it actually make to leave them on? This recipe is the result. I now have two more bottles (plus a little for the "cook") of beautiful liqueur to give as gifts this Christmas. Yes, this version isn’t quite as sweet as the last so the tips must be a little bitter, but that can be a good thing. It still has the beautiful pink of the original, and the strong rose taste. Leaving the white tips on really sped things along. I simply picked through the petals to get rid of any bad ones, put them in a clean jar and poured hot syrup over them. 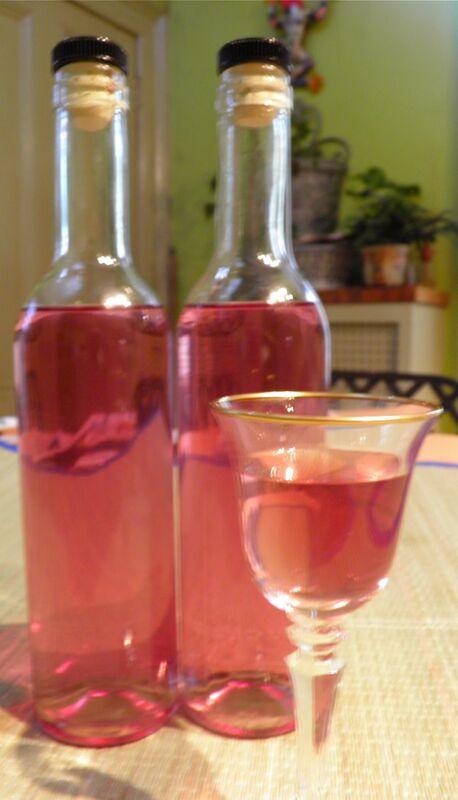 In 48 hours you add the vodka and “voila” – Rose liqueur. For those who missed the recipe last time, here it is again with my modifications. If roses are still in bloom where you live, you should really try this. 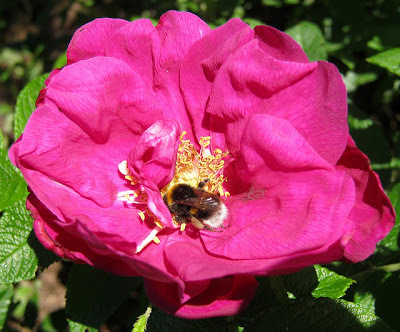 Be certain that the petals you choose are free from pollution and/or pesticides. I have a white rosa rugosa growing next to my red one but it's not currently in bloom. Using white petals would be interesting as I would expect the liqueur to be nearly completely clear but still rose flavoured. The flowers smell the same as the red. Something for next year! Bring the sugar and water to a boil in a saucepan and let simmer for 5 minutes. 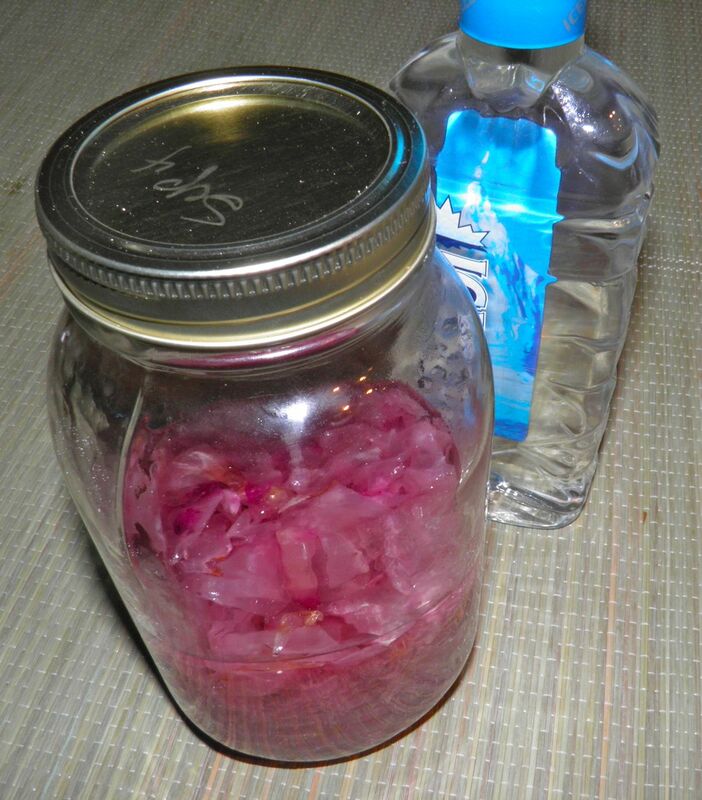 Lightly crush the petals in your hand and place with the lavender (if using) in a sealable container like a Mason 1L jar. Pour the hot syrup over the petals and seal the container immediately. This will contain the essential aromatics that are the flavour of your liqueur. Place the container in a spot out of direct sunlight for two days, shaking the container occasionally when you walk by. After two days the liquid will be pink. It probably will happen much sooner. You can use wild roses as well, but rugosa are a darker red and yield a pinker end product. Wild roses bloom quite early in the summer in Nova Scotia. Do not use roses from a florist or other store as they probably contain pesticides. At the end of the steeping the rose petals will have lost most of their pink colour. Strain the syrup through a cloth and squeeze to get all the liquid out of the petals. If you have some residue, strain again. Combine with the vodka and bottle. * Dried lavender flowers can be purchased at health food stores such as Planet Organic on Quinpool Road, Halifax.